Only Karl Lagerfeld could turn a supermarket into a destination spot. Today’s Chanel Fall 2014 show transformed Paris’s iconic Grand Palais into a full-fledged Chanel Shopping Centre, complete with rows upon rows of double-C branded canned goods, condiments and more. Among the editors and fashion elite in attendance were Rihanna and Chanel ambassador Keira Knightley, who both wore mock crop tops and skirts from the Spring 2014 Couture collection. Keira stuck with her go-to black and white palette, pairing her look with feminine metallic pumps, while Rihanna was in pale-purple and donned matching lavender sneakers and fanny pack. Take note, the mock crop top is the new crop top. 1. Kendal Jenner added to her so far very short, yet very accomplished modelling resume by walking down the Chanel-ified supermarket aisles. Kim was a very gracious older sis about it all. 3. 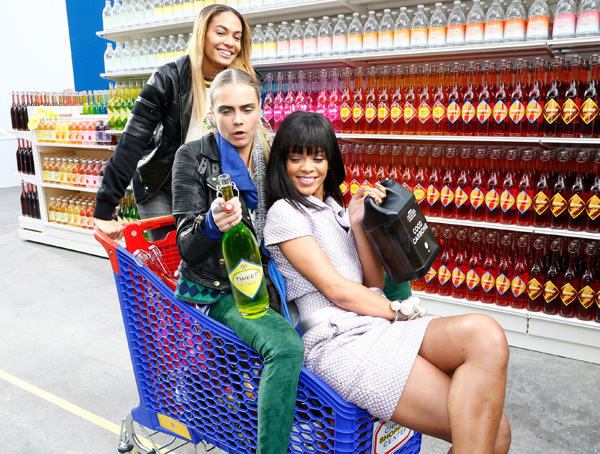 Rihanna and gal pals/show models Joan Smalls and Cara Delevingne horsed around after the show, getting in a Chanel shopping cart and playing with the props. Given Cara’s past antics, are we really surprised though? 4. Stop the presses. There is such a thing as a Chanel chainsaw. And a Chanel welcome mat. And double-C pink rubber gloves. We never thought we’d end up coveting household goods, but here we are. 5. Remember that now-infamous line uttered by none other than Karl himself: “Sweatpants are a sign of defeat. You lost control of your life so you bought some sweatpants?” Well, it seems like sweatpants are now okay in his books…as long as they’re Chanel sweats, that is. After walking the runway, the models perused the aisles loading up their Chanel baskets and shopping carts with double-C treats. Even better, lucky attendees were given the chance to shop the aisles once the show ended.